(Dan Trimmer, 2000). (Kaskel Sdlg. x Tetra Ruffled Masterpiece) Tetraploid 24” EE, Evergreen, Re. This 6” green yellow is amongst the first flowers to bloom in the garden, and it strongly reblooms 4 sets of scapes for me. Tetra Ruffled Masterpiece has been a magnificent parent as a diploid, and now we have its genes as a tetraploid. AMERICAN FLYER is the first introduction offered involving these exciting new genetics. 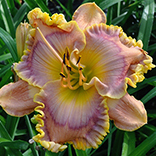 Ruffled Masterpiece imparts segment width, intense ruffles, blunt sepals, and importantly for the hybridizer, pod fertility. 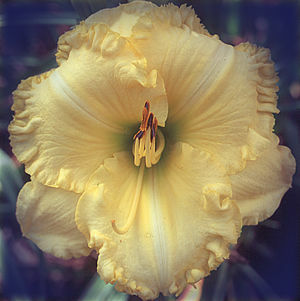 AMERICAN FLYER is an easy parent, an excellent grower, and increaser and a must for people seeking a different look in their yellow/gold lines. First scapes carry two or three lateral branches and 25 buds just above the foliage, and succeeding scapes continue to be well branched and budded, each slightly above the previous. Last summer I was almost ready to plant seed made on the first set of scapes while I was still crossing onto AMERICAN FLYER’S final blooms.